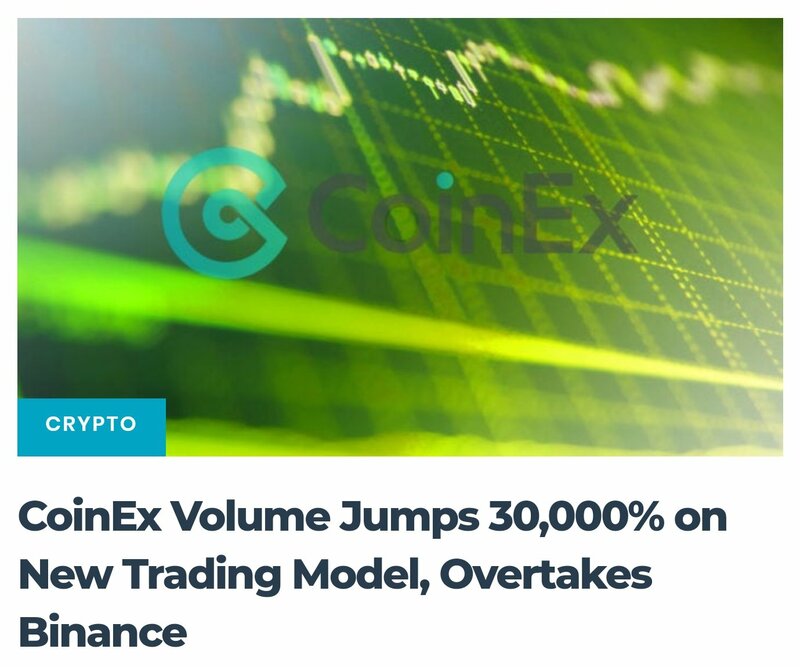 CoinEx Overtakes Binance - What is the CET Token? price is actually very undervalued at 0.09$ and its rapidly growing! It seems to getting BIG! Qualification: For ID verified accounts ONLY; Transactions that use CET as fees are excluded in trade-driven mining. Duration: 180 days in total with an EST. daily yield of 20 MILLION CET. Difficulty: The upper limit of CET for hourly mining yield per account. To balance daily CET yield, CoinEx will readjust "mining difficulty" at 0:00 (UTC) everyday based on earnings and difficulty of the last day. API is available to access current difficulty. Payout: Calculated and allocated at every o'clock. CoinEx reserves the rights of final explanation of readjusting rules of Trade-driven Mining. Qualification: Min. holding of 100 CET. Distribution: CoinEx will allocate our daily transaction fee income (including all coin types) to ALL CET holders proportionately (i.e. Your CET balance/Total CET). For instance: If our daily transaction fee incomes include BCH, BTC, CET and USDT, you will receive 80% of these incomes in BCH, BTC, CET and USDT proportionately. Attention: You will receive 0 dividend when the amount is below 0.00000001. Calculation: Every o'clock from 1:00 to 24:00 (UTC), we will take a hourly snapshot of your CET balance and allocate 80% of transaction fee income of the last hour to ALL CET holders on the snapshot. These dividends will accumulate on an hourly basis. Allocation: Your daily dividend will be sent to your account at 00:00 (UTC) of the next day. 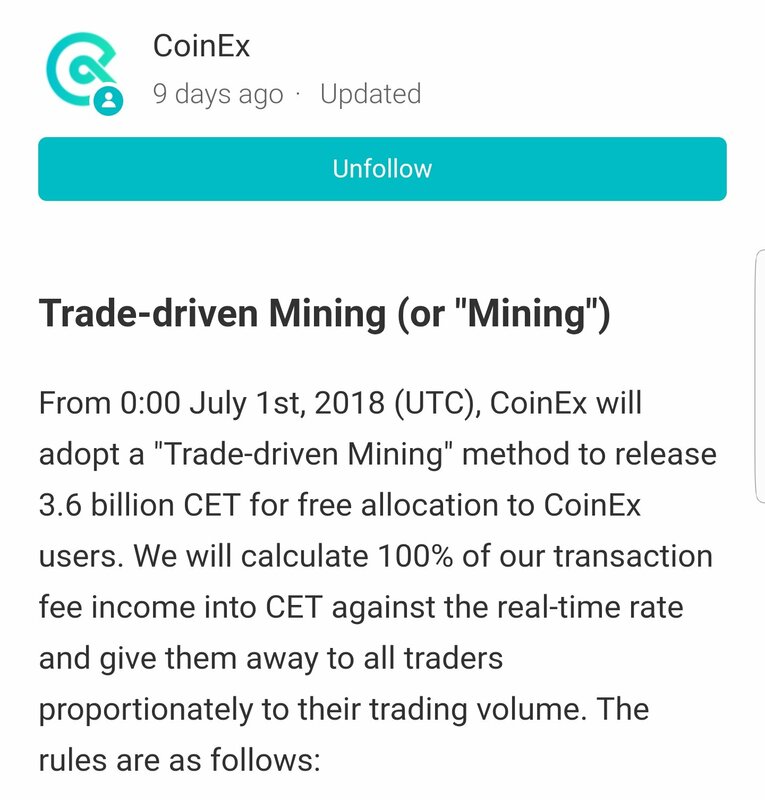 Duration: From 00:00 July 1st, 2018 (UTC) to the end of "Trade-driven Mining". CoinEx reserves the rights of final explanation of readjusting rules of Dividend Distribution. Special promotional campaign rights such as FREE new coins to CETbalances. Voting rights for new token listing free of charge. How Can Blockchain Help Our Christmas?